The new projects and updates unveiled at the first day of Adobe Max 2016—the largest one yet—would make you feel like this is the future. Lying at the heart of these innovations is the Adobe Sensei, “a framework and set of intelligent services built into the Adobe Cloud Platform which dramatically improve the design and delivery of digital experiences”—it uses A.I. and machine learning to solve the complex experience problems faced by the creative community. In its impressive first keynote session that kickstarted the popular creativity conference, Adobe demonstrated how Adobe Sinsei has been integrated into its products and platforms to allow digital professionals to work better, smarter and faster. Fuelled by feedback from users about what they really want when at work, the newly announced features are meant to address the challenges of inefficient workflow, limited productivity and hurdles to seamless collaboration. The result is a collection of new creative tools, as well as added functions to oldies but goodies like Photoshop and Premium Pro. However, the most exciting announcements have to do with projects that made their debuts in recent years, with the spotlight falling on the youngest members of the Adobe family, including Adobe XD, Adobe Stock and a brand new 3D design app named “Project Felix”. Scroll down to learn more about these enhanced programs—you can find out more about what’s new in the 2017 release of Creative Cloud here. A user-friendly, all-in-one tool for creating apps and websites, Adobe XD has been fine-tuned with collaborative tools that let design teams co-edit projects in real-time. The full Adobe Stock site would be released at Adobe Max. The stock image marketplace collaboration with Reuters would give users access to thousands of editorial images and videos. Its impressive new visual search option would make finding that perfect image a lot easier. 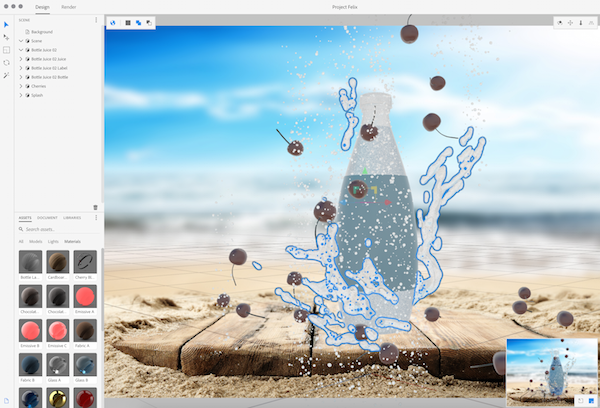 Made for graphic designers, Project Felix is a powerful tool that enables you to create photo-realistic composites with 2D images and 3D assets without having to spend years mastering 3D imaging skills.